From the very first few notes, that fall down soft as raindrops introducing the epic opener and title track of their debut, THE ORDER OF ISRAFEL totally caught me. As the softness vanished to give way to their heavy, slow and massive riffage, the foursome takes no prisoners. They just play Doom at its best! If you expect this first effort to be repetitive, monotonous or sounding like so many other bands, you couldn’t be further from the truth – from the uptempo second track ‘On Black Wings, A Demon’, the fierce yet sluggish hypnotic hymn ‘The Noctuus’ to the promising invocation and final song ‘Morning Sun (Satanas)’, “Wisdom” contains an incredible variety and versatility of sound. Some to bang your head to, some to kneel down hailing the Lord Almighty – guess Tony Iommi will take this place for all disciple of Doom – and some to just have a good time rocking. Fronter Tom Sutton (best known for his previous activity in Japanese Doomsters CHURCH OF MISERY and his current Classic Hard Rock outlet, Swedish Rockers HORISONT) does not only contribute his six-string skills, but also proves to be one hell of a vocalist. Apart from the four chapters of “Wisdom” one can enjoy both on Vinyl and CD, THE ORDER OF ISRAFEL is a pure live experience! So do yourself a favour and convince yourself that Napalm Records made the damn right choice by offering these guys a deal! According to the Neon Genesis Evangelion Wiki, The seventh Angel, Israfel (イスラフェル Isuraferu), has the appearance of a massive, humanoid creature (…). Israfel has a face/mask, (…) which resembles a yin-yang symbol, and has a pair of razor sharp claws and can shoot an energy beam. It has two cores located in its chest, matched on either side of its center torso by four external bone-like rib structures. How much of this is part of the bands’ name, THE ORDER OF ISRAFEL? Tom: I have now heard about that character, but I didn’t know about it when I came up with the name of the band. Israfel was actually mentioned to me by a friend once as the angel of music, and that idea really captured my imagination. Music is such a positive thing, and acts almost like an angel in our lives. It seemed perfect as a symbol for a group of people who really live for music. Once I looked into it a little further, I found out that the name was used in an Edgar Allen Poe poem, and is one of the four Islamic arch angels. Althoug some of the how, when and where you got together is published on the Metal Archives, would any of you like to recap the early stages of the four of you ending up forming a band? Tom: The concept of the band has been around for about 10 years. I recorded the first songs I wrote for this band 10 years ago. Once I joined CHURCH OF MISERY, I felt like I didn’t have time to look for members or anything, but I knew I’d do it one day. When I worked for PENTAGRAM as a guitar tech, Patrik’s old band, DOOMDOGS played a few shows with them, and that’s how I met Patrik. When I decided to move to Gothenburg, he put his hand up and said he’d be interested in jamming. So, it was he and I at the start. He knew of Hans, but had never met him. He just knew that Hans was a SABBATH fanatic. I tried a couple of other people before we jammed with Hans, but Hans had that combination of heaviness and swing that was just right for us. We played like that for a while, just the three of us, ‘cos it took some time to find the right second guitar player. Again, we tried a couple of other people before Staffan came along. Actually, Staffan and I were house mates. He asked to hear some demos, and liked the songs, and it felt right playing together straight from the start. We’re very lucky in that we’ve found just the right people both musically and personality-wise. We’re all great friends. Patrik, you told me in Munich quite some of the story how the band got its deal with Napalm Records – could you please share this with us again? 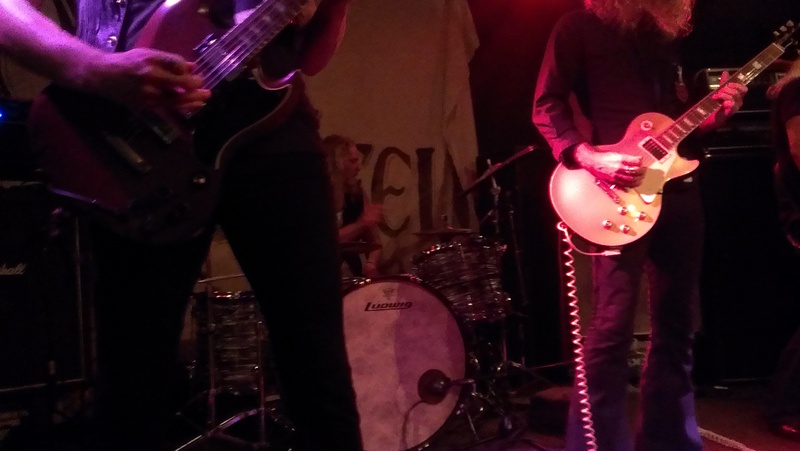 Patrik: Well, we had our first gig ever as suport act to UNCLE ACID AND THE DEADBEATS and the place was packed, over 400 people in the audience! A friend of mine filmed the first song wich was Wisdom and he sent it to me after the show. We looked at it and we felt really happy about it. We decided to send it out to record labels just to show them that we were around and thought that some would maybe react to it and give us some feedback? And man did they react! We got positive feedback from 6 labels who wrote that they wanted to hear more and that they might be interested in signing us, some even offered a deal from just this video. Napalm answered a couple of days before christmas last year and Sebastian A&R at the label wrote that this was among the best stuff he had heard in a long time and that he really wanted to work with us but needed to hear some more music before signing us. The fun thing was that we just started the recording of our debut album but we had no demo stuff recorded att all so we told him that he had to wait ’till the album was mixed and mastered before hearing any recordings. He told us that the owner would not allow him to sign us without hearing some proper recordings but we told him again that he had to wait ’till the album was done and i also told him that we had 5 more labels who showed really big interest in us from the live video. While recording the album we did a live recording of a full show in Gothenburg and sent it to Napalm. Sebastian loved it and took a meeting with his boss and got allowed for the first time to give a proposition to a band just from a live video. The rest is history. How well does it work to have four people with totally different backgrounds (Tom being the Globetrotter with at least another band, currently HORISONT, Staffan so much younger, Patrik and Hans being married)? Tom: It’s funny, but we get along amazingly well. It could be weird, but it isn’t. As long as everyone’s on the same page in terms of enthusiasm and commitment, it can work. And we are. We all love this band, and are willing to put in the time to make it something special. Hans may be almost double Staffan’s age, but the maturity level’s pretty much the same. Ha! You just been on your very first tour supporting LONELY KAMEL in Europe – how was the experience with the new band? Tom: it was totally great! I mean, just from the standpoint of LONELY KAMEL being really fun guys to be on tour with, it was a great time for all of us. Musically, it was a big experience for us too. I’ve done a lot of tours before, but never with a new band where I’ve been involved from the start. It was almost a bit scary to go out in front of people without the safety net of a tried and true name to fall back on. We were out there for the first time. There were always a few people in the audience who had heard the album, but most people were hearing us for the first time. We had some amazing moments where we got huge reactions from people, and that felt good. One guy in the UK saw us in Glasgow, and then followed us to two more shows, even sleeping in his car to make it possible. That kind of reaction is something you dream about. Looking at 2015, THE ORDER OF ISRAFEL are announced for Sweden Rock and Gothenburg Sound already. Are there any other festivals coming up, like Freak Valley, Hammer of Doom etc and will there be another tour to look forward to? Tom: Yes, I believe there are already two more festivals that we have agreed to do so far. We can’t say anything until they announce the shows, sorry! Hopefully, the next tour won’t be far off too. According to the bands’ Facebook page there is serious work on songs for the next album going on – when can we exspect the successor of “Wisdom” to be out? Tom: It’s hard to say at this point. I guess we’ll book the studio once the shape of the album is becoming clearer. I have a lot of songs saved that we haven’t worked on yet as a band. Things usually take longer than you think they will, so I would say early 2016? Maybe? He he! I personally can’t wait to get to work on some of these songs. It will be fun on tour to be able to play a different set every night. Talking about songwriting, how does that work, do you have one conniving dictator or actually work together with everyone? Tom: That’s me! I’m the evil dictator! Ha ha! In The Order, it’s me who comes up with almost-finished songs, and then we work on them together, and the other guys work on the details of what they’re going to play. It really is a band feeling, though. Patrik commented on the fact that even though I come up with the songs, he feels very much that it’s his bass playing style that you hear, and that he feels free to do what comes naturally to him. Everyone in the band makes huge contributions to the sound of the band, Actually, the first sound you hear on the album is Staffan’s guitar, and it’s a guitar part that he came up with. So, the concept and songs are me, but everyone’s DNA is very much a part of what you hear. With the end of 2014 ahead: What is your favourite album of the year? Tom: I think Patrik and I have both said that for us, it’s THE SKULL’s ‘For Those Which Are Asleep’. It’s exactly that classic doom sound that is so close to my heart. Real songs, beautiful riffs. I can’t wait to see them play some time. And we’d love to tour with them. It seems that stylistically, we’d be a perfect match for each other. And finally, any last words? Thanks to everyone who has checked us out. We’ll be on tour again soon, I hope! Cheers! Once again she was calling for me, the big city – calling for big city nights as the new kids on the block were set to visit Munich during their first ever European tour, which happens to be their first tour ever. 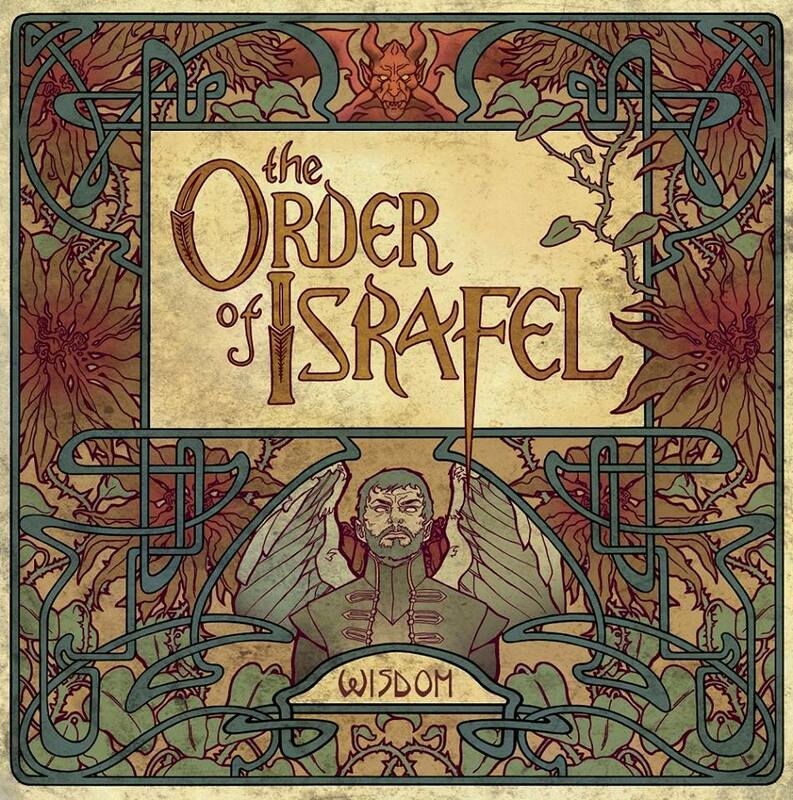 With the debut album “Wisdom” at hand, THE ORDER OF ISRAFEL bring some spicy Swedish tunes to southern Germany and I for one just could not miss out on this opportunity. Not at last for the chance to catch up with former CHURCH OF MISERY string-bender Tom Sutton (who relocated from Australia, to Japan and finally to Europe), this being his latest joint venture apart from his being the on-again-off-again or stand-in string-bender for Gothenburg-based Classic Hard Rock outfit HORISONT. Small stage, still enough room for professional posing! To make a long introduction shot(er), after stumbling upon the title track of their first attempt – a ten plus minutes epos of such a tremendous beauty and undisputable versatility – I’ve gotten quite nutts with this new band. 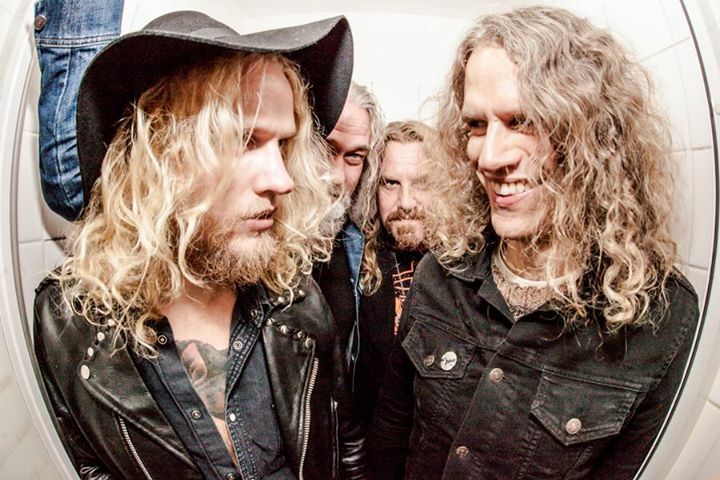 Only downer would have to be the fact, that THE ORDER – Tom Sutton (vocals&guitars) Patrik Andersson Winberg (bass), Hans Lilja (drums) & Staffan Björck (guitars) – was only opening for Oslo Rockers LONELY KAMEL for the run of live shenanigans. But chance has it, that my name was on the list for the night, or rather my name was the entire list at Feierwerk, Munich. Third show on the schedule and with the big city audience not quite what this foursome deserves. 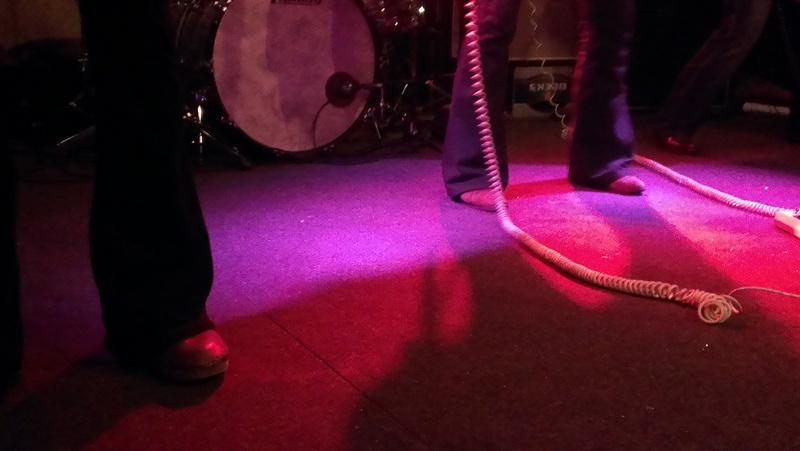 Boots, Clogs & Bell-Bottoms – These guys know how to dress! After a bit of a pumpy start, the four musicians deliver fine selection of tracks from the first release “Wisdom” that add to a good half hour. Way too little time to truly enjoy all of the bands’ greatness and well-established musicianship. But that’s the thing with the opening slot. 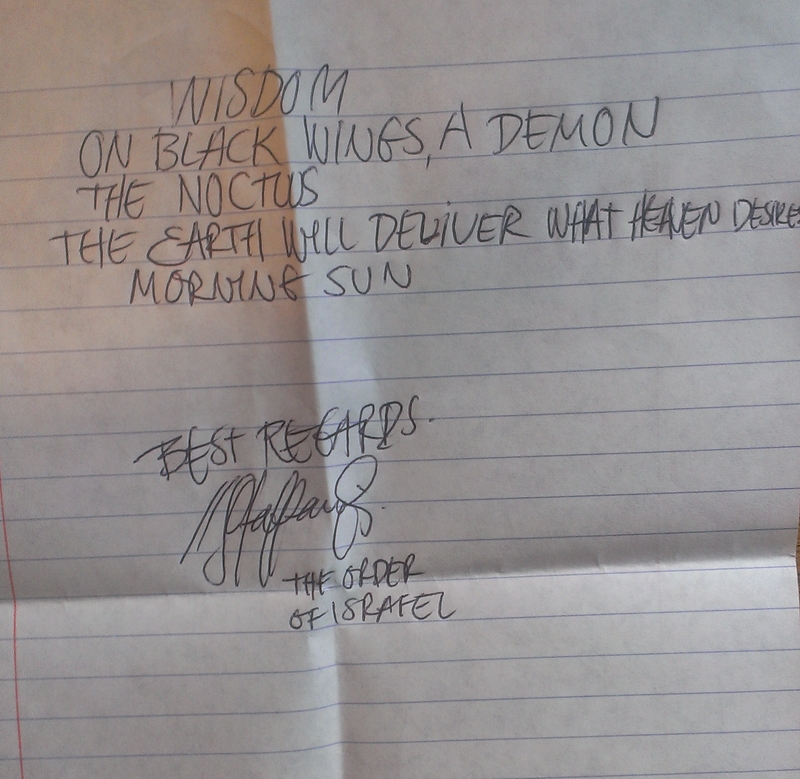 Anyway, the five songs chosen manage to represent the album well enough – from the aforementioned ‘Wisdom’, to up-tempo tracks like ‘The Noctuus’ and the grant finale with ‘Morning Sun’ – an upright invitation to all headbangers – THE ORDER OF ISRAFEL know their game and they play it in a full pro manner, remaining fans of the music themselves first and foremost. The trip to Munich was once again all worth while and THE ORDER OF ISRAFEL is a name one should learn to spell right, cuz they sure will make their way in the long run – at least if they live up to their own Wisdom! 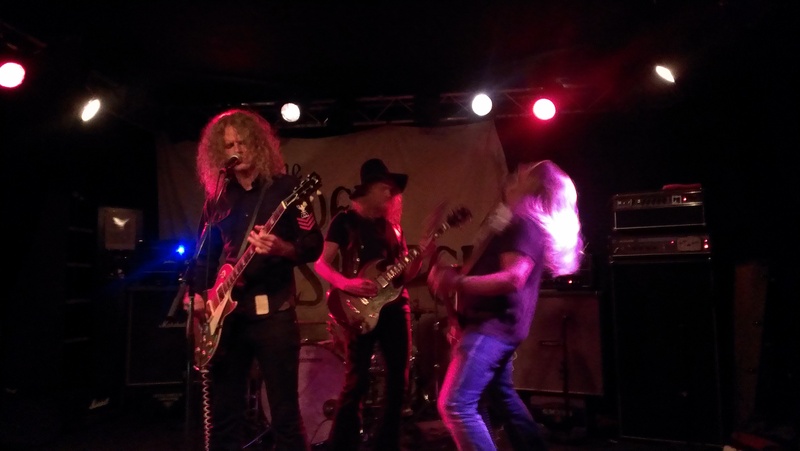 GRAVEYARD – check in from „Endless Night“ video shoot! 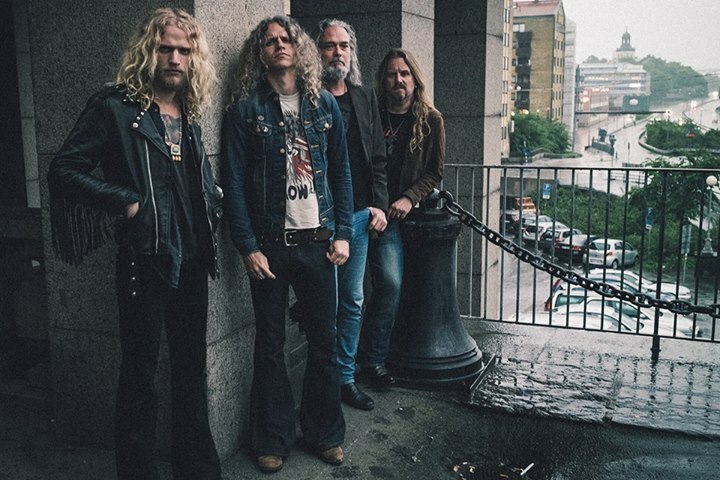 Swedish classic rock superstars, GRAVEYARD, just shot the video for the song „Endless Night“, which comes off the bands highly anticipated new album, „Lights Out“. „Lights Out“ will be released October 26, 2012. Find a short comment by the band and a still from the set attached/below.